I loved every single story. It was one of those books where you sit on your couch and put up a DO NOT DISTURB SIGN. It was so easy to visualize each character and every situation. I highly recommend this book. It was GREAT ! 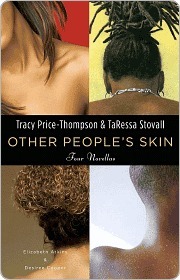 (FROM JACKET)In "Other People's Skin", Tracy Price-Thompson and TaReesa Stovall, along with fellow authors Elizabeth Atkins and Desiree Cooper, take on one of the most controversial topics within the African-American community: the self-hatred caused by intra-racial prejudice and the ongoing obsession with skin tone and hair texture. In other words, the skin/hair thang among black women.It begins with TaReesa Stovall's "My People, My People", in which a successful advertising executive acquires firsthand knowledge of prejudice when her clients insist on using light-rather than dark-skinned model. Next comes Tracy Price-Thompson's award-winning story "Other People's Skin", a tale set in 1970s Louisiana, where a dark-skinned young woman must come to terms with the bigotry of her light-skinned family. "New Birth", by Desiree Cooper reveals the intense roles that money, class, and skin color play in the intra-racial relationship between Catherine, a wealthy, light-skinned lawyer, and Lettie, her dark-skinned house cleaner. Finally, Elizabeth Atkin's "Take It Off" tells the story of a biracial girl who hides her coarse, braided hair from her friends at a mixed-race university in Detroit. "Other People's Skin" is the most innovative and varied anthology of sisterhood and unity to date. Each novella entertains, challenges, and, most important, offers healing to the reader-no matter what her race, skin tone, or state of mind. Four Enlightening Narratives The finest and well-executed novellas, I have read this year, tackling and exploring internal/external dislikes within the African American community and the negative impact these elements have had and still do on society at large. The sufferings, indignations, and dilemmas that the characters encounter in each of the stories are genuine, complex, and many-sided, providing the rationale as to how and why skin hue, hair texture, class, and one’s occupation have been used to define and divide a people. What makes the stories so captivating is the blending of historical details and fiction, covering various periods, forcing us to reexamine our own hidden and overt biases that can impair a group’s advancement when it comes to social, political, and economic empowerment, and to remind us that no matter the hue of one’s skin, the consistency of one’s hair, or a person’s position in life, we are all one and share a connection, and our hopes, ideas, and achievements can materialize and be celebrated by working together without limitations, even if we take different paths to accomplish those objectives. Particularly enjoyed the Michigan connections in some of this work, as I can relate to it. These are fairly strong novellas that pleasantly surprised me just when I thought they were veering toward becoming overwrought. I appreciate the generational range in the characters, too, though, except for the first piece, these tend to stick with the idea that older folks do the teaching. What an awesome book. It totally gave me an eye openoer on how most black woman feel about skin tone and hair texture. It made me a little bit more proud of my cfowning glory and my caramel complexion. Love this book. Great set of short stories by a local author. Tracy Price-Thompson TaRessa Stovall - Tracy Price-Thompson is the national bestselling author of the novels, Black Coffee, Chocolate Sangria, A Woman's Worth, Knockin' Boots, and Gather Together in My Name. Tracy is a highly decorated Desert Storm veteran who graduated from the Army's Infantry Officer Candidate School after more than ten years as an enlisted soldier. A Brooklyn, New York, native who has traveled extensively and lived in amazing places around the world, Tracy is a retired Army Engineer officer and Ralph Bunche graduate Fellow who holds a bachelor's degree in Business Administration and a master's degree in Social Work.Tracy is also the co-editor of the anthologies Other People's Skin and Proverbs for the People and composes professional literary reviews based on established elements of writing for several print sources.Tracy lives in Hawaii with her wonderfully supportive husband and several of their six bright, beautiful, incredible children.